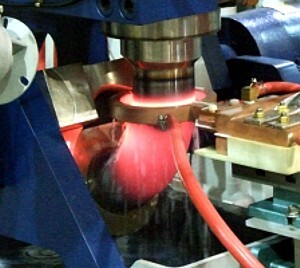 The use of an induction heating system provides significant benefits as compared to cold forming a bend in tube or pipe. The main advantage is that the induction heating system minimizes the deformation of the material and distortion of the cross-section while achieving tight radius bends. An induction coil heats a narrow section of the pipe and once the desired temperature is reached, the pipe slowly passes through the coil as the bending force is applied. Once the bend has been completed, the heated area is cooled either by a spray of water or air. One of the unique features of the combined induction heating tube & pipe bending systems provided by Ajax TOCCO Magnethermic is the advanced controls package that allows for the precise bends, with minimal operator input. The controls integrate the mechanical bending and induction heating processes into one combined control system, thereby reducing complexity for the operator. The controls also allow for multiple part recipes and for storing process data for each bend cycle. The quality of the surface finish with induction bends is equal to that of cold bending and better than fire bending. As it pertains to ovality and wall thinning, induction bends are superior and since they eliminate the need for welded or mechanical joints between bends, the integrity of the finished product is higher. The radius of the bend infinitely variable and the wall thickness can vary from Schedule 5 to 2.5" thick with no alteration in tooling. Induction bending times are considerably less than in fire bending or weld fabrication and does not require sand filling or internal mandrels. Reducing production and inspection time saves money. Induction bending is simple and effective, heating material by using an induced electrical current. Pines Benders has a range of products that can handle from 2" to 62" pipe and will manufacture a machine to meet your requirements.